We have been providing chimney sweeping services to our customers in Oxford for over twenty years – the addition of stove supply and fitting came in 2007, when we became the Oxfordshire Stove Company. With years of experience in maintaining chimney health, and additional experience in CORGI accredited gas fitting, our team gained HETAS registration and began trading within the increasingly popular stoves market. As a business we have an ethos that includes offering open, independent advice. The right stove and installation is vital for a number of reasons, and we believe that helping people make the right choice is in our interest too – as chimney sweepers and a local provider of maintenance services. We will make sure your appliance is suitable for your specific needs, whether you’ll be burning wood or multifuel, and we’ll make sure your chimney is lined appropriately too. When you are fitting an appliance such as a stove, you need to know it is being installed by fitters who fully understand the safety repercussions of stove installation, and the effect on full, efficient functioning. Not only are we fully accredited, we are recommended by customers in your local area, and we carry out all stoves and chimney work ourselves – we never contract out any aspect of our installation or maintenance services, meaning we are accountable for the quality of everything we do. 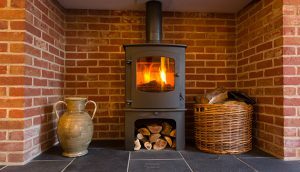 So whether you’d like a stove and are looking for the right one, you need a reliable local sweeper, or you have a problem with an existing stove – from appliance maintenance, to birds nest removal; the Oxfordshire Stove Company could be just the supplier of advice, products and services you’ve been looking for. Get in touch today for further information, a free estimate, or to book a site appointment. Available for stoves in Oxford and beyond.